Welcome to swimsuit season! Okay, let’s be honest it is a little early for swimsuits here in Minnesota, but I am sure if you are like the rest of the state you have warmer destinations top of mind over the next few months. I certainly cannot wait for summer and all things sunshine! If you have been following along with me a while then you know we love a good beach getaway. But when it comes to picking the perfect suit where does one even begin? It can feel overwhelming and now with a baby boy in our lives and on the move, the time I would have spent cultivating the perfect wardrobe is a thing of the past! When it comes to tackling that beach vacation look no further than adding your biggest secret weapon, a little black one-piece. In all honesty, after having Leo, my swimsuit shopping is a whole lot different. Still not confident in the much smaller suits I would have worn before having a baby, one-pieces + high waists are my new favorite trend. Also, never having previously to deal with having a chest, let me tell you, I have no clue what to do with it. These photos are totally out of my comfort zone but also something I want to cherish forever. Becoming a mom and watching my body change has been amazing, challenging, and it is totally out of this world to even look at myself like this!! Feeling confident is of extreme importance for any woman especially all of the new moms out there. I couldn’t be happier to partner with Bloomingdale’s and Trina Turk to talk about all things swim trend. You know how much I love Bloomingdales and they have been my go-to for vacation wear time and time again. You can read previous partnership posts like this one on our babymoon, here, and here. If you could come over and see my swimsuit bin, you would freak out because no one loves all things swim and warm weather-related more than this girl. Growing up in Texas I longed for a swim party as a little girl, but we April babies usually get very extreme weather and splashing around in a bikini never seemed to be in the cards. I often settled for the Olive Garden and tiramisu, at least a girl has options! I love all the trends in swimwear this season. Off the Shoulder, one-pieces belted, ruffles, there are so many adorable suit options to pick! The most flattering part about this little black suit is the criss-cross motion across the front that creates a very slimming and feminine curve. It is also supportive of the larger chested ladies. I genuinely think this could be the sisterhood of the traveling one-piece. It looks fantastic on all body types, and it comes in a gorgeous aqua as well! 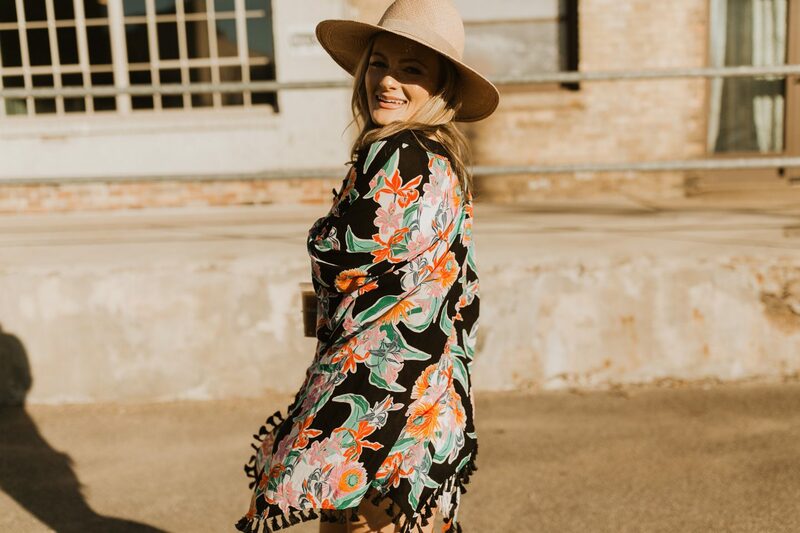 I love being able to throw on a cover-up like this adorable printed and tassel-trimmed option by Trina! 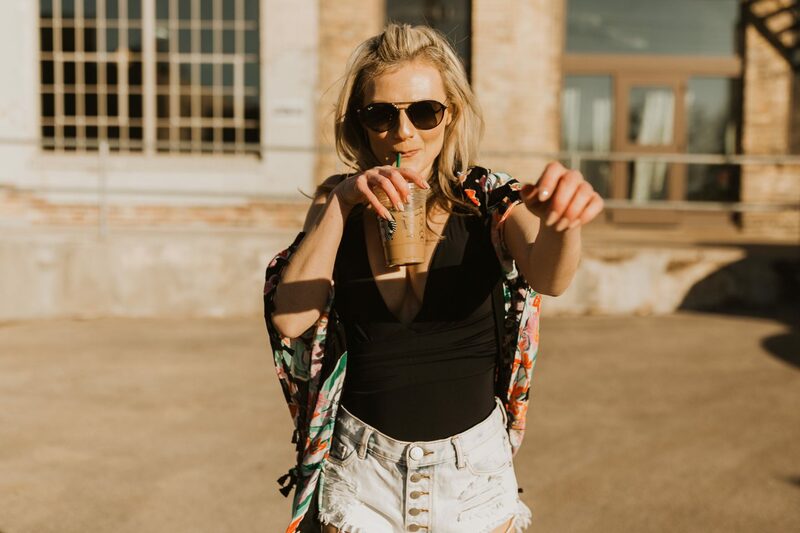 Pair your one-piece with sandals and a wide-brimmed hat you are ready to go from the beach to drinks or an iced coffee run! Which of course is the best part of wearing a one-piece, it is like wearing a bodysuit! Throw on a pair of great shorts (these are my favorites), and you’re off! Super convenient and a time saver. Be sure to check out all of my favorite swimsuit options below by Trina Turk and thank you to Bloomingdale’s for making this post possible. Links to everything I am wearing below and much more! Images by Tippy Jordan.